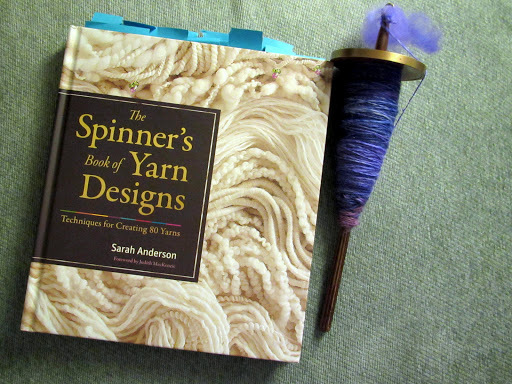 I’ve posted about being inspired by an excellent spinning book before, but MAN this one is fabulous, too. This textbook-like tome will not teach you the very basics, like fiber characteristics and exactly step-by-step how to add twist to fiber, it assumes you’ve done that once or twice before. However, it does detail nearly everything else in a very simple and straightforward manner. Great information on washing fleece, using handcards and combs, using a drum carder, the differences between worsted and woolen yarns, different kinds of drafting to achieve those yarns, and (finally!) descriptions of Z/S twist and twist angle that I actually understood are all provided. 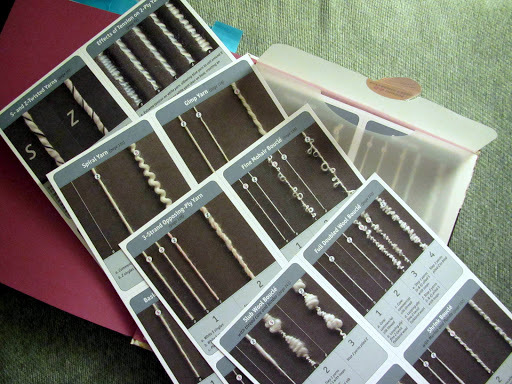 The basics are followed up by separate chapters on every conceivable type of yarn you can make. And I do mean every. I can’t imagine any other yarns existing, truly. These crepe yarns are ones I’d really like to try out, they look so interesting and are pretty similar to the cabled yarn I’d made before, except they are 3-ply instead of 4-ply which creates a neat effect. The book also covers the really crazy novelty yarns with very simple, easy-to-understand instructions. Best of all, it shows photos of nearly every yarn either knit or woven up so you can get an idea of what the yarn might look like in a finished fabric, which is super helpful with crazy yarns like the beehive pictured above. And as an added bonus, the instructions for all of the different yarns are provided on little notecards that you can punch out and keep near your wheel or take with you for reference. As I hope you can tell, I thoroughly enjoyed this book and can’t wait to try my hand at all the crazy yarns within. 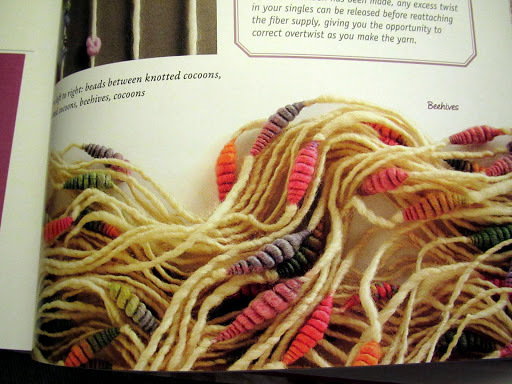 Here’s a review from the Knitty blog that I think is pretty accurate and shows additional photos from the book. It also reminded me that the author also did a sock knitting experiment to figure out which yarn construction formed holes the slowest, which was super interesting! As you can see in the first photo, I’ve marked many many pages that I want to refer back to, so this book was well worth the money for me. You can also see my spindle, I’ve been doing my best to spin for a few minutes every single day this month. I missed 2 days out of 8 so far… hopefully I’ll be less busy in the coming weeks! What books have been inspiring you lately? And are you spinning along this June? This entry was posted in books, InspirationSaturday, spinning by shoelaceswitcher. Bookmark the permalink.